In this end times prophecy study, we’ll focus on the “temple” in 2 Thessalonians 2:4, which many Pastors say is a future rebuilt Jewish temple, where the Antichrist will proclaim to be God. What you will learn is that the Antichrist system is already seated in the temple of God, and proclaiming to be God. If you’ve read the The Beasts of Daniel and Revelation study, then you know that the Roman Catholic Church is the ‘Antichrist Beast of Revelation‘, the ‘Little Horn of Daniel‘, and the Pope is the ‘Son of Perdition‘. If you’ve read the 70th Week of Daniel study, then you know that the foundation for the 7 year tribulation period and the need for a rebuilt Jewish temple is invalid. Keep in mind that when the Apostle Paul wrote 2 Thessalonians 2:3-4, the Jewish temple was still standing, as it wasn’t destroyed by the Romans until 70 A.D., so any reference to a physical temple would have been to that temple, not an end times temple. So what does Paul mean? In John 2:14, Jesus spoke of the physical temple. The Greek word for the physical temple is hieron. Then just five verses later in John 2:19-20, Jesus spoke of the spiritual temple. The Greek word for the spiritual temple is naos. Whenever Paul used the word naos, he applied it to followers of Jesus, the Christian Church, which is a literal temple, but not a physical building. The spiritual temple is made up of followers of Jesus, Christians. In 2 Thessalonians 2:2-4, where Paul is telling us about the Son of Perdition, he again uses the Greek word naos. Paul is saying that the Son of Perdition would sit in the temple of God, that is, in the Christian church. Paul is telling us that he would pretend to be Christian in order to deceive the world, which lines up directly with the Roman Catholic Church and the Pope who pretend to be Christian. Instead of being an infidel who doesn’t believe in God, like so many pastors teach, the Antichrist does not reign outside of the Church, but in the very bosom of the Church. Pope Francis sits on this throne between two cherubs, as if he were God. Paul places the Son of Perdition nowhere else than in the very sanctuary of God. 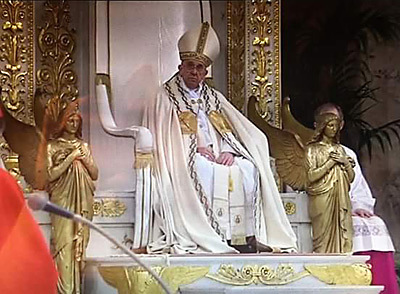 The Pope sits (assumes a position of authority) as God in the temple of God. He proclaims to forgive sins. He proclaims that salvation is only available through the Roman Catholic Church. He preaches a message of ‘salvation by works’, instead of through the blood of Jesus. The Pope of the Antichrist Roman Catholic Church misleads 1.2 Billion Catholics into believing that salvation is through them, not Jesus Christ. And the Jesuits of the Roman Catholic Church are pushing the world into a New World Order, where they will cause everyone in the world to worship them or die. Paul’s prophetic words in 2 Thessalonians tell us that the Antichrist Son of Perdition would usurp the authority of Jesus Christ by assuming an unauthorized position of power inside the Christian Church. The reason for this deception is to get Christians looking forward to a one-man antichrist in the supposed 7-year tribulation period; instead of looking back and realizing that the Antichrist Roman Catholic Church has been seated in the temple of God for many years. Many Pastors teach that the Abomination of Desolation will take place in a rebuilt Jewish temple. To find out the truth, click on Abomination Of Desolation Deception. It only remained for the Popes to assume Divine honours. In the person of Boniface VIII, whose accession took place in 1294, the Pope sat “as God in the temple of God.” Human ambition could rise no higher. The Pope boldly lead claim to the attributes and prerogatives of Deity. He represented the Father, the Son and the Holy Ghost. He claimed to rule in three worlds, Heaven, Earth and Hell; and in token thereof was crowned with a triple crown. He paraded himself before the world as the infallible Teacher of faith and morals. Exalted above bishops, above councils, above kings, above conscience, from his decisions there was no appeal. He was the supreme Judge of mankind. Lifted up to sit on the high altar of St. Peter’s, the chiefest Church in Christendom, he was publically adored, cardinals, the princes of the Church, kissing in turn his feet; bishops bending log before him in deepest reverence; and nations worshipping him as the visible representative of the Godhead, possessed of power to pardon sins on earth, to canonize saints in heaven, to loose souls from the pains of purgatory in the world beneath; to judge, to govern, to bless, to save mankind; whose sentences, clothed with the authority of God, were inheritently, irreversible, irrevocable, final and everlasting. And for what ends, and with what effects has the God-like power of this great Usurper been employed? Let history answer. Let the stake reply. Let the Inquisition speak. Let the Waldenses, the Wickliffites, the Lollards, the Hussites, the Huguenots sound forth the answer. Let Italy, let France, let Spain tell what they have witnessed. Let Roman Catholic lands in their notorious degradation, and Protestant lands deluged with blood by Papal wars and massacres, bear their testimony. The Bible prohibited; idolatry enforced; the gospel denied; Christianity caricatured; millions deluded; millions led to destruction; who can estimate the world-wide effects of this diabolical travesty of the religion of Jesus Christ? The cup of salvation changed into the cup of death; revealed religion, God’s greatest, highest gift to man, transformed into a snare, an instrument of delusion, tyranny, and eternal ruin to countless souls, and generations of mankind. The comprehension of the character of Romanism and the papacy was a gradual growth. In its slow development the doctrinal errors of the Church of Rome were recognized as unscriptural long before the antichristian character of the papacy was perceived. Here’s a graphic to use on Facebook and other social media sites, to help people see the truth about the antichrist.